At the height of the Cold War, one could say that everything in the public was scrutinized more than necessary. There was a hint of secrecy and in other words a terrifying sense of immediate nuclear destruction that could tear the world apart in an instant. Sport had its own Cold War and in particular, hockey. And if there’s two things on this planet that really turn my crank, it’s history and hockey. In the 1980s, Communism in the Soviet Union was in full swing yet slowly starting to die. A win in the sporting world equaled a win for the whole country and in extreme aspects, a win for Communism. Sport was used as propaganda for the nation and the Red Army team were the country’s main idols. It came as no surprise when former Soviet Army general Viktor Tikhonov lead one of the best and one of the most feared hockey teams in the game. Feared because they had the Iron Curtain hanging over their shoulder and the KGB watching every move. the provided barracks; no doubt a salute to life in the army. 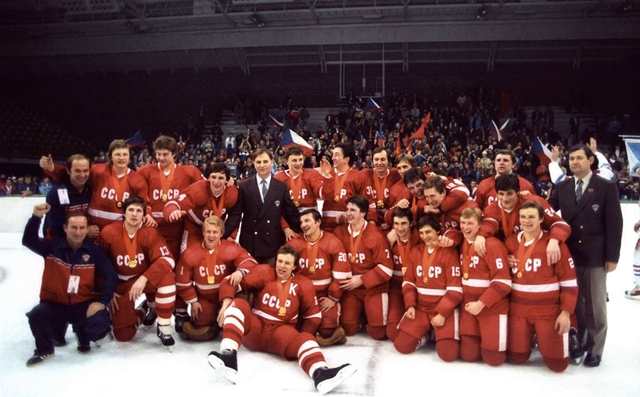 Slava Fetisov, who captained the Red Army squad, was trained so hard that it has been said he could skate backwards as fast as any Western player could forward. How’s that for conditioning. Former Soviet Union coach and credited as the god-father of Russian hockey, Anatoli Tarasov was once quoted as saying: “A hockey player must have the wisdom of a chess player, the accuracy of a sniper and the rhythm of a musician.” You could, quite frankly, describe Tikhonov’s team in that exact way. Of course, playing together for 11 months out of the year will definitely bring talent together at outrageous circumstances but the stickhandling, skating, and overall look of hockey the Soviets gave to it pushed the sport ahead 20 years in time. 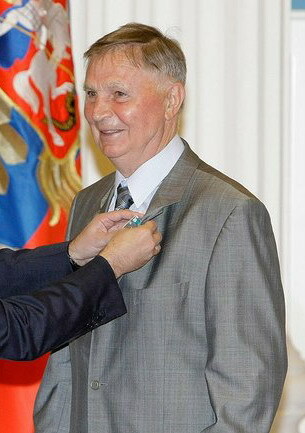 Tikhonov’s methods were built around the strategies of the game. Working down angles. Being able to have that Gretzky instinct of knowing exactly where your teammates were with the puck. God forbid if you didn’t have a clue. He learned his ways of course pig-backing from tactics that were put in place by Tarasov. Practices would leave you barely making it back to the locker rooms and passing out from exhaustion on the ice. They both expected everything from you. 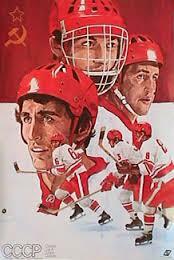 While they demanded your best, Tikhonov and in a much broader sense, the Soviet Union would give their stars players nothing in return. Most didn’t receive big cheques; they were a pittance at best and then shunned after their big wins. After all, it wasn’t a win for the team, it was a win for Communism and the country! Every game was an Olympic style event with less fanfare. That’s where the defection of Russian players started to take place. The players knew deep down how they were being treated wasn’t right but they couldn’t speak up for fear of being sent to isolation in Siberia to put it bluntly. Nobody in their right mind liked the coaching style but they did what had to be done. Then the Soviet Union collapsed. Tikhonov had some of the BEST players under his wing. However with the threat of the NHL coming in and making offers now that they could entice players to the West, Tikhonov cut Pavel Bure, Valeri Zelepukin, Evgeny Davydov, and Vladimir Konstantinov in 1991 because he knew they’d be gone in an instant. It would save him the trouble. Those names should be familiar to you by now. While Tarasov and Tikhonov were hockey dictators in their coaching ways, we would not have the style or innovation of the game that we do today. As I mentioned earlier, they helped push the game 20 years ahead of its time. Nobody had seen what they did with stick on these shores before. Some players described it as ballet on ice. Sony Pictures is releasing a documentary on the entire squad entitled “Red Army”. I urge you to check it out and give it a watch. I can’t wait to see it myself. Feel free to follow me on Twitter: @MarchHockey or on facebook, www.facebook.com/marchhockey and drop me a line!